Apetivist: A former Southern Baptist minister turned atheist and free thinker due to research in Theology and Apologetics. I tried to speak with other ministers and even wrote my Professors at LU. All I got were stock answers and not one of them convinced me that they were anywhere near correct or logically sound.Everything seemed to make sense until I encountered the Problem of Evil(PoE). After much thinking and researching I found that the Free Will Defense that I previously held regarding the PoE had some major problems. How could I square the reality of suffering/evil in the world with an omnibenevolent, omnipotent god? It took me several years to think things over but eventually I came to see that the omni-characteristics of the Christian god didn't square up with the PoE. I was deeply affected by this information and although I continued ministry I so desired to answer this problem that I even began to read non-christian sources. I eventually began to see that the PoE was an insurmountable problem and that it had not been sufficiently addressed by Christian apologists and philosophers. I began to doubt whether I had sufficient reasons to believe in the Gospels. I also wrestled with what has popularly been called the Problem of Divine Hiddenness. I soon discovered the writings of Robert G. Ingersoll, George H. Smith, Thomas Paine, Jean Meslier, and Bertrand Russell . I tried to wrestle against their reason but eventually had come to see that they were in fact correct regarding their summations about Christianity. I tried to hold to a weak version of Deism until I read Michael Martin's book “Atheism: A Philosophical Justification” in 1991. It was then I admitted that I was an atheist. I remained rather quiet about my unbelief until after 9/11. I was then introduced to the work of Sam Harris , Richard Dawkins , Daniel Dennett , and Christopher Hitchens . However due to work I was not afforded a lot of time to pursue my interests. This changed when in 2010 I became 100% physically disabled by a rare neurological disease that left me bedridden and I spent that time reading and watching videos and documentaries. Eventually in 2011 I found The Atheist Experience on Youtube and continued to build up my knowledge and methodology in 2013 and onward. I decided to openly discuss atheism and also my love for Science, Humanism, Critical Thinking, and Skepticism on my personal Facebook largely to the discussions I had with Dr David Madison and John W. Loftus . I was met with great displeasure by some friends and family members but I decided this was who I was and I was going to continue despite their displeasure. 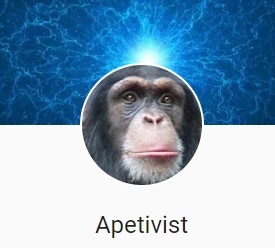 In 2017 I decided to start a Twitter account @apetivist as well as a blog at https://www.apetivist.com and quickly became well received and attained thousands of followers and readers. I dedicate a few hours daily to maintaining my Twitter account and keeping up with the latest theistic arguments. Feel free to follow me on Twitter and if you have any questions feel free to ask. The true origins of Christianity? ExChristian.Net: Apetivist: A former Southern Baptist minister turned atheist and free thinker due to research in Theology and Apologetics.